Berks Hunters Fighting Hunger sets new record in 2019 to aid Salvation Army. 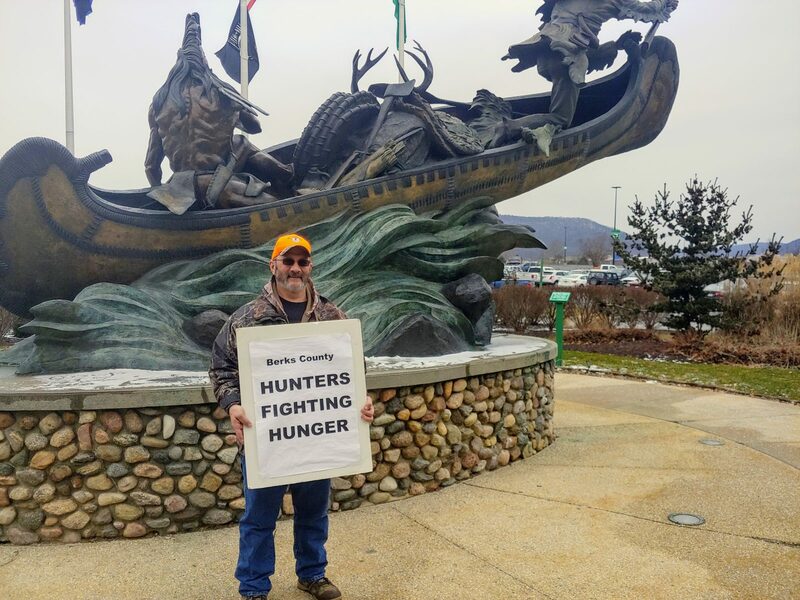 Jan. 19, volunteers for Hunters Fighting Hunger led my chairman Dave Hollenbach gathered the equivalent of 112,000 pounds of food to benefit the Reading Salvation Army. The majority of the collection was procured through a most generous donation of 3,5000 by the Alsace Manor FC Social quarters. Another large donation of food was donated by Paul Fretz of Morobito Bakery in Norristown. Volunteers at other locations throughout the county all agreed that individual donation of frozen foods, canned goods, etc. were exceptionally high this year. Mike Werner won a $25 gift card from Cabela’s and Dennis Krick of Reinholds won a $10 gift certificate from Crossroads Restaurant on Route 61 in Muhlenberg. Other donors won fshing rods from Big Daddy Rods. About 9,000 pounds of food was delivered and stored at the Reading Salvation Army on South 5th St. in Reading.